Regulatory authorities around the world can in future instruct manufacturers of chemicals and drugs to check their products for harmful effects on reproduction by means of a new test with molluscs. After over 10 years of funding by the German Environment Agency in Dessau, a project coordinated by Goethe University Frankfurt has now resulted in an OECD guideline (Organisation for Economic Co-operation and Development) for global chemical testing. The test analyses in the laboratorythe long-term effects of chemicals on reproduction in freshwater mudsnails (Potamopyrgus antipodarum). 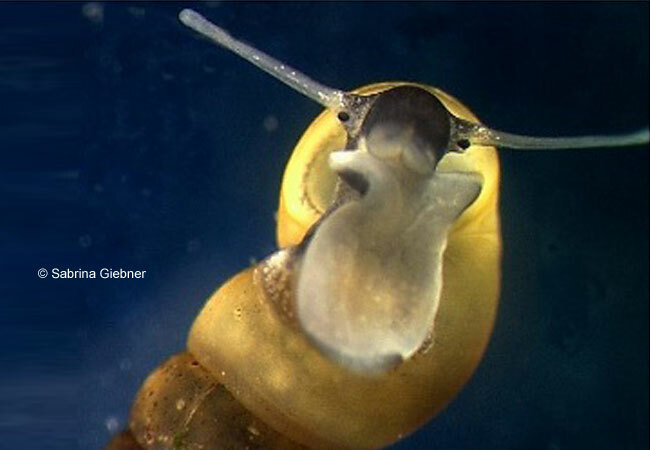 “Although this tiny creature is not an indigenous snail species, as what is known as a “model organism” its biological answers are also transferable to other molluscs, regardless of whether they stem from Europe, Asia or America”, explains Professor Jörg Oehlmann, coordinator of the test development team and head of the Department of Aquatic Ecotoxicology at Goethe University Frankfurt. Potamopyrgus is a water dweller and was introduced to Europe in the mid 19th century on board ships from New Zealand. However, this alien species is meanwhile part of the normal landscape in many of Europe’s watercourses. New chemicals which have not yet been approved and harm the mudsnail in OECD Test No. 242 in the laboratory would have the same effect on it and related species in the wild. Since molluscs, after insects and crustaceans, are the second most species-rich group in the animal kingdom, the loss of these organisms would be fatal for biodiversity and thus also for the correct functioning of the ecosystems. The development of the “snail test” therefore constitutes an important contribution to keeping our watercourses clean and healthy, since substances which show a toxic effect in this test for the snail can in future be identified and controlled prior to market introduction. For the test, female mudsnails are exposed to a concentration range of chemicals in ambient water. The organisms remain with the test substance in their test beakers for 28 days, after which the number of embryo amongst all surviving females is counted. “It’s a process which is easy to use and also suitable for everyday use by water authorities”, says Oehlmann. In their home country of New Zealand, both male and female mudsnails are found. In Europe, however, populations are composed solely of females which reproduce parthenogenetically. This makes using the test and analysing the results easier, all the more so since the tiny snail makes only modest demands on the laboratory. “The animal’s small size has another advantage: in comparison to many other test procedures, this test can be miniaturized and doesn’t take up much space”, explains Oehlmann. That makes it possible to test a larger number of chemicals.